Among a few decent April Fool's pranks, such as YouTube's TEXTp option (pick TEXTp as resolution for any YT video and see typography magic happen! It won't work on the Shoe Fairy clip, though. ), and people trying to spread the fake "NPH as Riddler in the next Batman movie" poster as a prank, when it has been around for weeks, I came across this obvious prank, which put a huge smile on my face for so many reasons. Or should we say…the “ducktor”? Neil Patrick Harris, a.k.a. television’s Doogie Howser, has signed on to star in a live-action version of Disney’s Darkwing Duck. The family film focuses on Harris as Darkwing Duck balancing crime-fighting with raising his adopted daughter Gosalyn. The role of Gosalyn is reported to be down to Elle Fanning and Little Miss Sunshine’s Abigail Breslin. Strong DVD sales of the popular ‘90s animated series led the studio to fast-track the project. 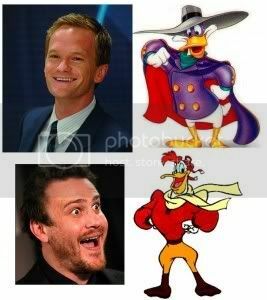 Disney is keen on securing NPH’s How I Met Your Mother co-star Jason Segel to play Launchpad, Darkwing’s klutzy sidekick. Let's ignore that it would probably be one of the worst film ideas ever — this just makes my heart all warm and fuzzy. And if I had time, I'd create a fake movie poster right now! Neil could totally pull off purple. And now, have a little rant about last night's Modern Family. No idea how much Apple paid ABC for what was clearly an infommercial for the iPad, rather than a funny episode. Everything with Cam, Mitch, Gloria and Manny is entertaining, but… honestly? I find Phil annoying as hell, and the actor, who plays him, not even remotely funny. Everyone in the States seems to love him, though, but I just don't see it. What the show needs in order to stay interesting in its second season, is additional family members, which !!!!SPOILER!!!! will probably happen once they introduced Cam's family. 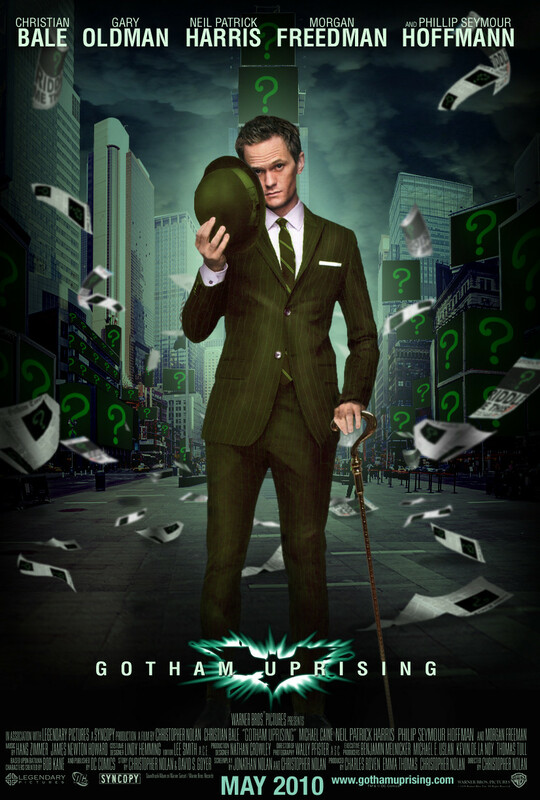 Where's the NPH as the Riddler poster?!?!? And hehe, I now need to see this picture of Darkwing Duck as a human! Post a link? Wow, that Darkwing Duck thing really IS freaky. I could totally see Neil and Jason doing it. I actually thought that Riddler poster was pretty good! But then I'm not a good artist myself. Damn, it's starting to make me want Neil as The Riddler. AFTER he's The Flash obvs. Right?? I could SO see it! It's weird. You know, I think they intend to film The Flash this year, and if that's the case, Neil cannot be in it. :/ However, just like the new Batman movie, filming might be postponed for The Flash, especially since they are already doing Green Lantern and probably Captain America this year. So you never know! I would be happy with both and I could actually see him in both roles as well.